SteelSeries believes there's a problem with today's gaming headsets becoming heavy and bulky. 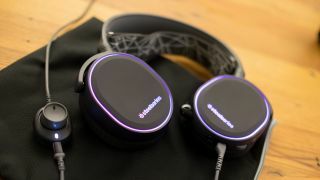 Now, going against the grain, the peripheral maker aims to reinvent itself with a new lineup of Arctis gaming headsets. With Arctis, SteelSeries has ditched the done-to-death red on black color scheme and introduced a new design that's much more minimalistic for modern times. Even the finish on the plastic is flat and matte, as opposed to the glossy varnish you'll find on most gaming headsets. Beyond looks, SteelSeries has completely reinvented the feel of the Arctis. Rather than sporting a headband with adjustable arms and an air gap cushion, the new headset features a fixed-length body and an elastic band modeled after ski googles. The use of a AirWeave for the ear cups also takes inspiration from athletic wear. This new fabric is breathable, thanks to a quilted design lined with plenty of holes for heat and moisture to get through while still providing a decent amount of sound isolation. SteelSeries has kicked off its new line of Arctis gaming headsets with three models. At the entry level you have the Arctis 3, which provides 7.1 surround sound through an analog connection for $79 (about £60, AU$100). Moving up, the USB A-connected Arctis 5 gaming headset for $99 (about £80, AU$130) introduces RGB lighting and DTS X surround sound, as well as an in-line controller to tweak your game/chat mix. Last but not least is the $149 (about £120, AU$200) Arctis 7, which pairs to consoles and PCs though a 2.4GHz wireless connection. Users can expect this wireless set of cans to last for 15 hours on a single charge, and stay connected to their platform of choice from up to 40 feet away.